Suffolk County Crime Stoppers and the Town of Riverhead Police Department are seeking the public’s assistance in locating a suspect who stole property from a home last month. Aquebogue, NY - November 6th, 2014 - Suffolk County Crime Stoppers and the Town of Riverhead Police Department are seeking the public’s assistance in locating a suspect who stole property from a home last month. Christian R. Fusco, 23, stole property from a home on Peacock Court in Aquebogue on October 17. There is an active warrant for Fusco’s arrest. 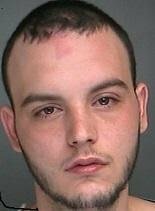 Subject: LongIsland.com - Your Name sent you Article details of "SCPD Crime Alert: Suspect Wanted for Robbing Aquebogue Home"